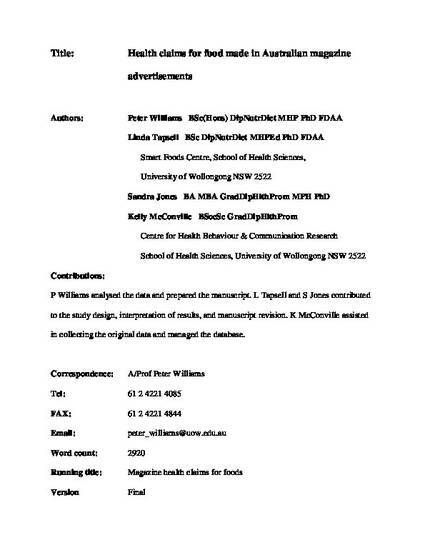 This article was originally published as Williams, PG, Tapsell, L, Jones, S and McConville, K, Health cliams for food made in Australian magazine advertisement, Nutrition & Dietetics, 64(4), 2007, 234-240. Aim: The aim was to describe the level of health claims being used in magazine advertisements, the categories of foods carrying health claims and the types of benefits being claimed for particular foods or food ingredients. Data were compared to similar studies of food labels and internet sites to reflect the impact of rule governance of the different media and highlight implications for the current proposed changes in food standards legislation. Methods: From January to June 2005 a survey of all print advertisements for food in Australia’s 30 top-selling magazines was undertaken. The results were compared with those from a 1996 survey of health claims in Australian magazines and more recent surveys of claims for food on product labels and on internet sites. Results: The survey found 29.5% of 390 advertisements for food carried a health claim. Many of the claims were high-level claims (29%) or therapeutic claims (8%) which are not permitted by current food standards. The most common benefits being promoted related to cardiovascular disease, energy, cancer and weight control and most claims referred to the effect of the whole food, rather than specific ingredients. Results were similar to previous studies of food labels and internet sites. Conclusions: Health claims are being used widely in the print advertising of food products in Australia. Moreover, the presence of high-level and therapeutic claims in this media bears significant implications for the implementation of rules governing health claims on foods across the different media.